Vlassis in Athens is a terrific family taverna, with a crazy disco, meaning a huge round platter placed next to the table, with dozens of mezze plates of all colors and types. You simply can't miss the burning parsley color in each and every dish. 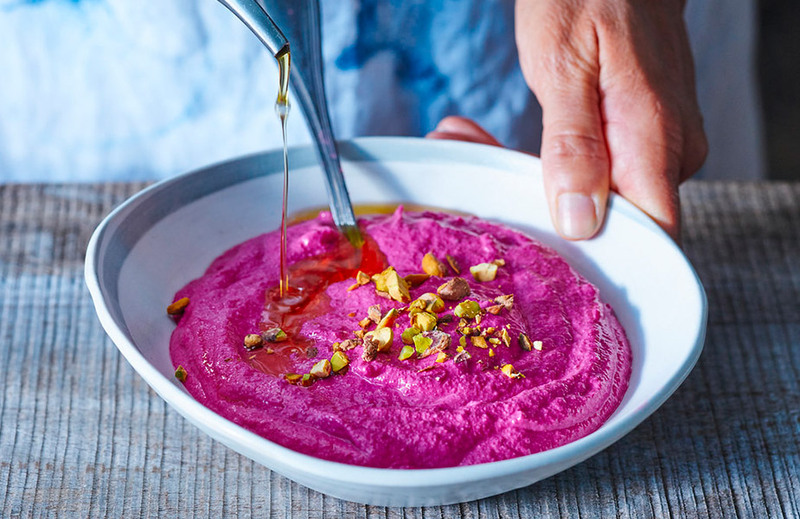 It's a delicacy that mixes the sower taste of Greek yogurt with the beet's natural sweetness, and it can also be served as a salad: instead of blending the baked beets, cut them into cubes or slices. Heat the oven to 180 degrees Celsius. Sprinkle salt in the baking dish and place the beets in. Bake them for around two hours, until they are soft (check by sticking in the end of a knife). Cool them for a little while, peel them, cut them to quarters and let them cool completely. Blend the Beets in a food processor. Add the yogurt, the olive oil and vinegar. Season them with salt and pepper and place them in a serving dish. Scatter the pistachios on top and serve.